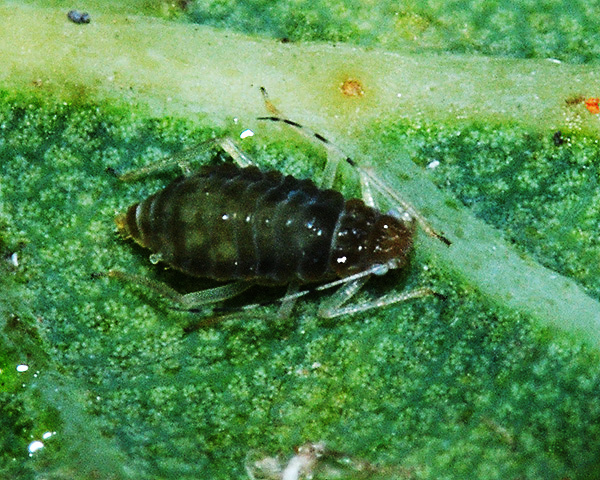 Immature Tuberculatus annulatus are yellowish or green (see first picture below) with pale antennae apart from black bands at the tips of the segments. 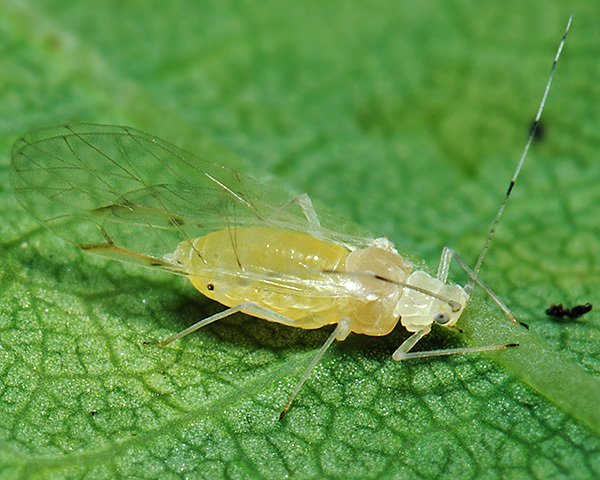 The adult winged viviparae (see second picture below) are very variable in colour ranging from yellowish, greyish-green or pink to purple in summer. The terminal process of the sixth antennal segment of the antennae is 0.87-1.1 times the length of the base of that segment. Abdominal tergites I-III each have a pair of spinal processes (see second picture below) (cf. Tuberculatus borealis which has a pair of spinal processes on each of tergites I-IV). The spinal processes on tergite III may be dusky pigmented and are particularly large (cf. Tuberculatus neglectus which has unpigmented spinal projections on abdominal segment I-III of similar size). The tarsi are black. The siphunculi of adult alates are dark on the distal one third to two thirds.. 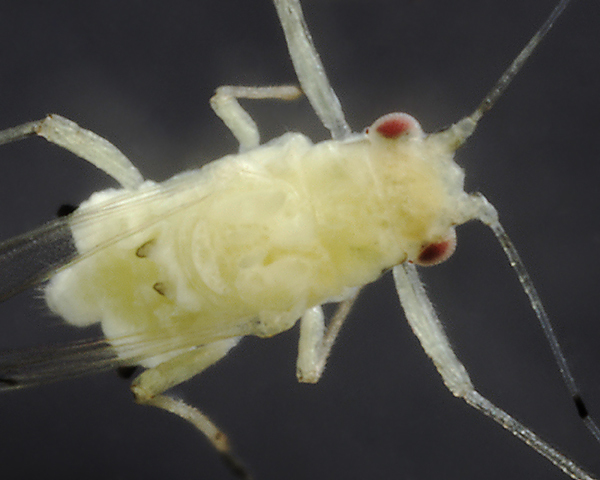 The body length of Tuberculatus annulatus alates is 1.7-2.2 mm. Warning: Since they are under the folded wings, the spinal processes can be difficult to see on live specimens! The micrographs below show two alate Tuberculatus annulatus, in alcohol. The second of these shows the darkened spinal processes on tergite 3 especially clearly. 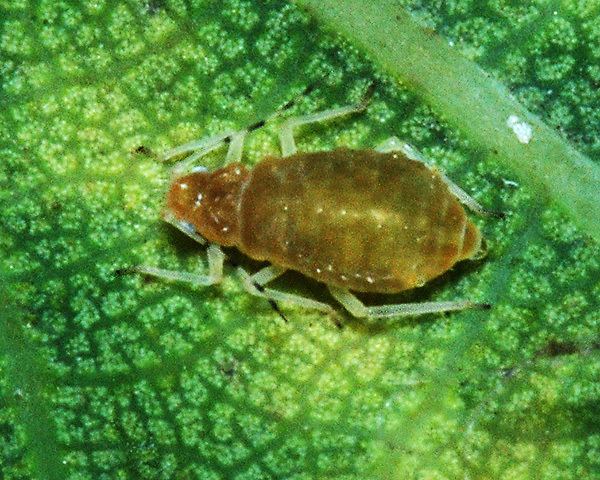 The common oak aphid is found on the undersides of leaves of oak (Quercus spp. ), especially English oak (Quercus robur) and, less commonly, sessile oak (Quercus petraea). 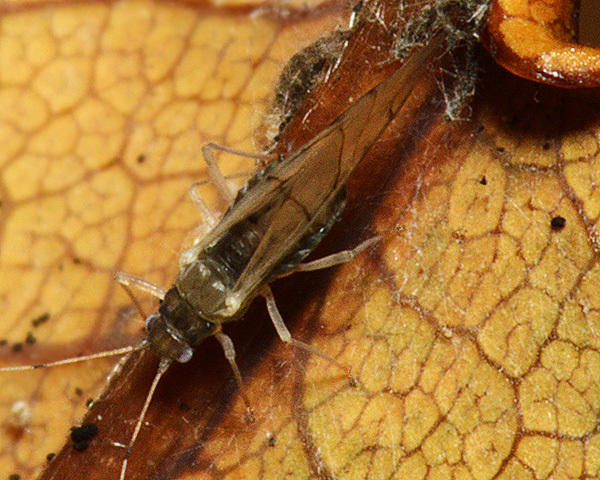 Winged males and wingless oviparae occur in October. Tuberculatus annulatus is distributed throughout Europe to Siberia and north-west China, and has been introduced to Australia, New Zealand, North and South America. Tuberculatus annulatus is well known for the variability in colour of the adults. In the first picture below the abdomen was pale green. In the second picture below it was more yellowish, but the difference is admittedly slight. 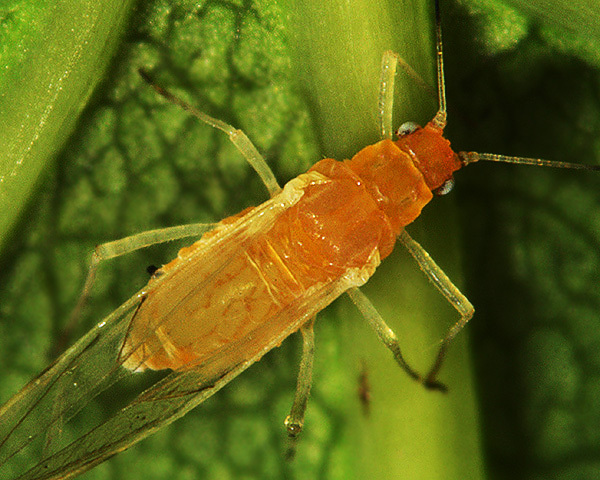 The alate in the picture below was salmon pink, clearly different from the yellow-green forms. The forms below represent the 'leaden-grey'; form described by Stroyan (1977). Rohitha & Penman (2012) compared development of the 'yellow' and 'green' colour forms of Tuberculatus annulatus. Development was significantly faster in the 'yellow' form than the 'green' form. Work by Coeur d'acieret al. (2017) using DNA bar coding suggested that Tuberculatus annulatus had an unusually high level of intraspecific divergence. This might reflect polymorphism, or the coming together of geographical variants, or it might indicate so far unrecognised sibling species. More recent work by Skvarla et al. (2017) has shown that the two colour forms have different COI barcode sequences, strongly suggesting two different species. Tuberculatus annulatus is mainly found on Quercus robur. It does occur on some other Quercus species, but generally not on Quercus ilex. 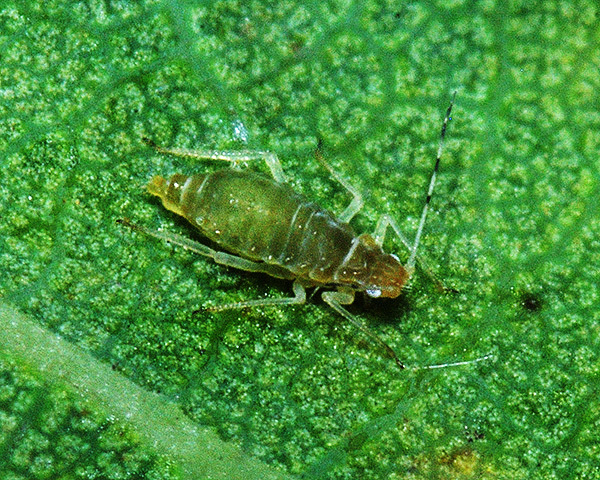 Kennedy (1986) suggested that the basis for specialization in oak aphids was differences in tarsal attachment. Attachment to the rough textured leaves of Quercus robur is achieved by means of pretarsal claws, whereas Myzocallis schreiberi uses flexible pretsarsal empodia to attach to the smooth upper surface of individual trichomes of Quercus ilex. Tuberculatus annulatus does not enter reproductive diapause in summer, although it does reproduce at a lower rate than in the spring. 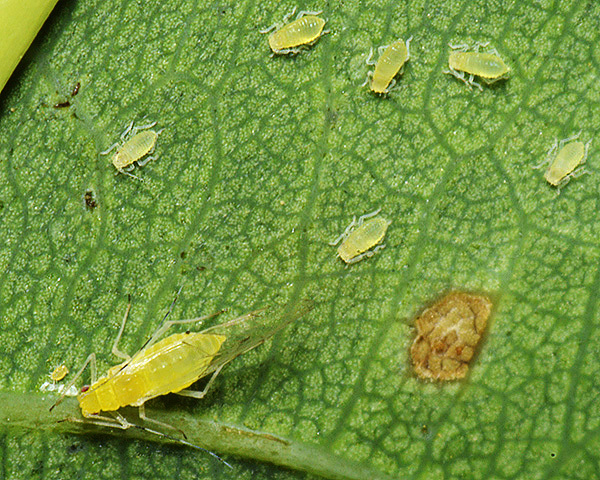 Small clusters of aphids can develop at larviposition sites, although the aphids are usually well spaced out along the leaf veins (see picture below). 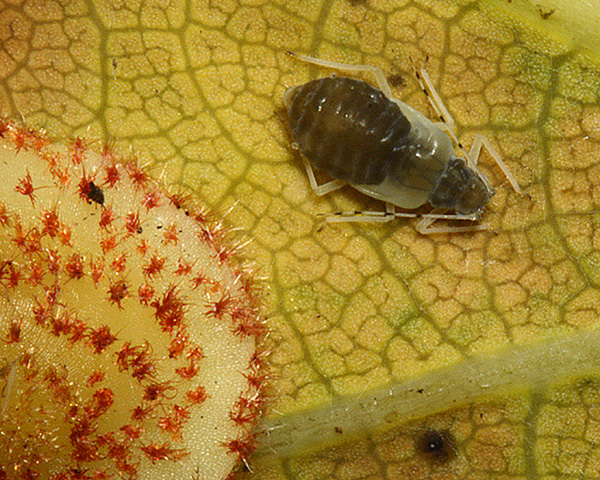 Sexual forms are produced in autumn. 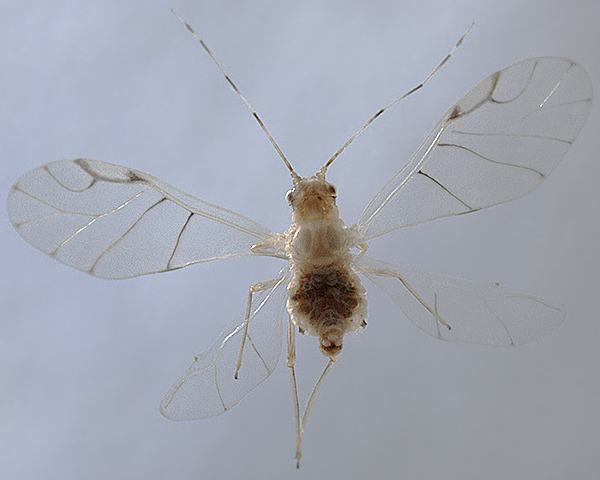 The oviparae have the apex of the abdomen very distinctly produced (see picture below). The colour of the oviparae ranges from blackish green to yellowish brown (see pictures below). The marginal sclerites of the thorax and abdomen extending to abdominal tergite 4 are darkened. 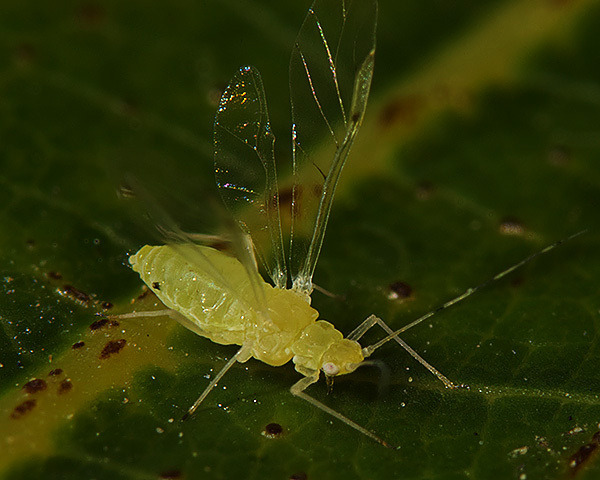 We think this aphid with developing wings (see picture below) found amongst Tuberculatus annulatus oviparae in late October is an immature male, although it could be a late-developing viviparous female or even an alatiform ovipara. Estay et al. (2008) elucidated the intrinsic endogenous structure of Tuberculatus annulatus populations based on data from eight locations within the UK, and evaluated the contribution of exogenous forces to the dynamics of each population, especially winter temperature and precipitation. Winter precipitation was found to have a positive effect on the carrying capacity of the system. Several mechanisms were considered for this. Rainfall may modify the nutritional quality, chemical defences or digestibility of the host or it could affect productivity. Spatial correlations in environmental variability can synchronize population changes over wide areas, known as the Moran effect (Moran, 1953)). There is little information on the natural enemies of Tuberculatus annulatus. Barczack et al. 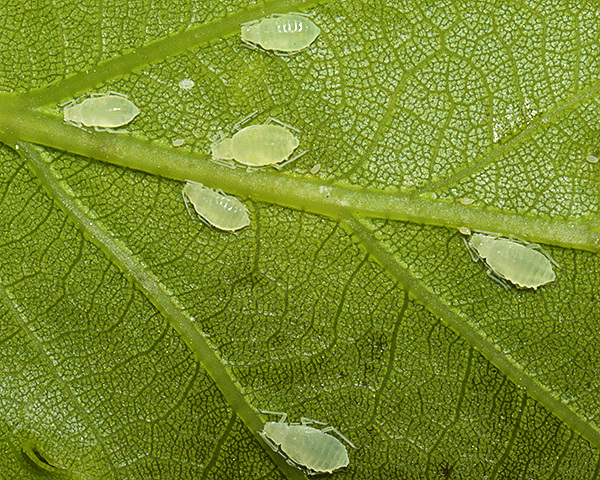 (2008) described the parasitoid guild of Tuberculatus (Tuberculoides) annulatus on leaves of Quercus robur in Poland. 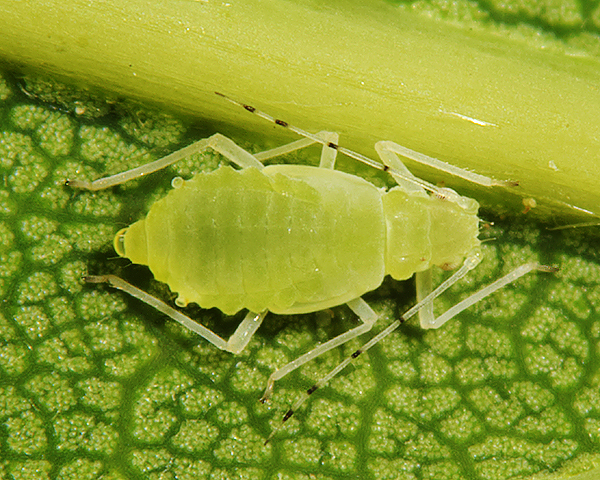 The aphids are largely solitary so the activities of predators tend to go unobserved. 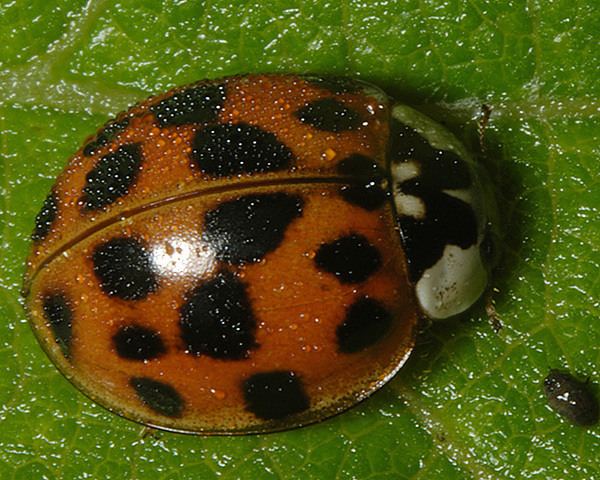 The picture above shows a possible predator - Harmonia axyridis - in oak woodland frequented by Tuberculatus annulatus in southern England. Tuberculatus annulatus have been recorded from 21 Quercus species, and 2 Castanea (Castanea pumila, Castanea sativa). 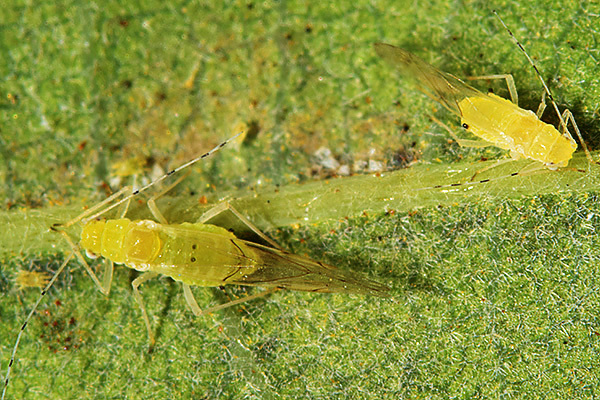 Blackman & Eastop list about 225 species of aphids as feeding on oaks worldwide, and provides formal identification keys for aphids on Quercus. Of the 34 species on common or pedunculate oak (Quercus robur) Baker (2015) lists 14 as occurring in Britain: Hoplocallis picta, Lachnus longirostris, Lachnus roboris, Moritziella corticalis, Myzocallis boerneri, Myzocallis castanicola, Phylloxera glabra, Stomaphis quercus, Thelaxes dryophila, Thelaxes suberi, Tuberculatus annulatus, Tuberculatus borealis, Tuberculatus neglectus and Tuberculatus querceus. Of the 24 species on sessile or durmast oak (Quercus petraea) Baker (2015) lists 12 as occurring in Britain: Lachnus longirostris, Lachnus roboris, Moritziella corticalis, Myzocallis boerneri, Myzocallis castanicola, Phylloxera glabra, Stomaphis quercus, Thelaxes dryophila, Thelaxes suberi, Tuberculatus annulatus, Tuberculatus borealis and Tuberculatus querceus. 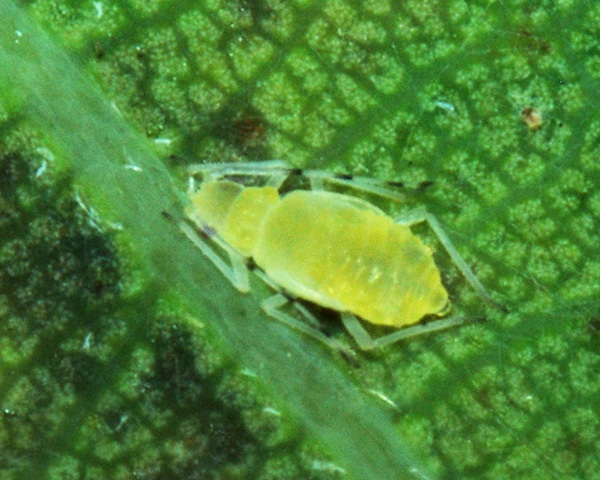 The picture below shows an alate Tuberculatus annulatus (left) on the same Quercus petraea leaf as an alate Tuberculatus neglectus (right). Note the dusky spinal processes on tergite 3 of Tuberculatus annulatus. Barczak, T.(1994). The parasitoid guild of Tuberculoides annulatus (Htg.) 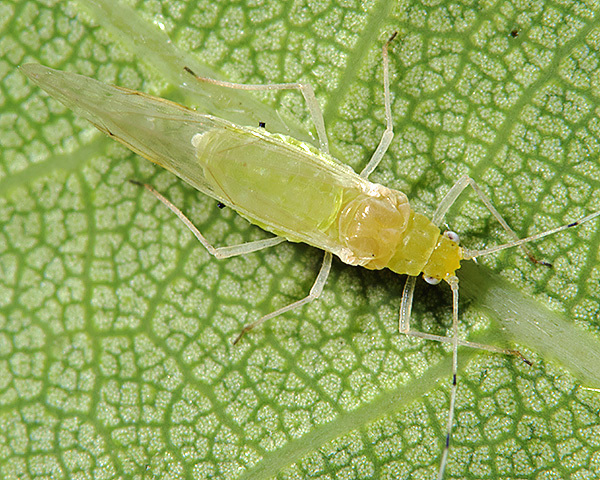 (Homoptera: Phyllaphidiae) on leaves of the brown oak, Quercus robur. Polskie Pismo Entomologiczne 63 (1&2), 157-168.